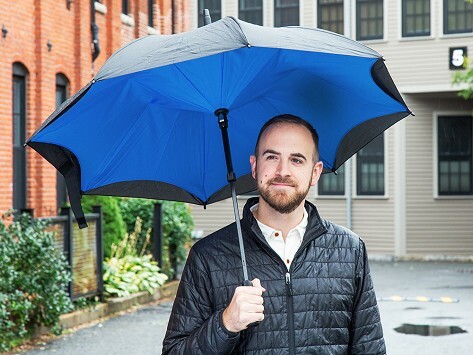 The KAZbrella reverse umbrella keeps you dry from rain showers and rain drops alike. Its patented reverse-folding mechanism means this umbrella works upside down to trap water inside a double canopy and avoid unwanted splashes and drips. This also makes it easier to get into cars and through doors without splashing yourself (or anyone else). The umbrella is also designed to stay intact in the face of wind and it won’t blow inside-out. Dimensions (when closed): 34.6" x 2" x 2"
This is an awesome umbrella. This is just like advertised! I love how it works easily and perfect! Now I am waiting for rain. It is going to be so much fun! It’s bigger than it looks in the picture. It looks gorgeous, but I wish you made it in a smaller size. By turning a typical umbrella on its head—and putting in plenty of work—the Kazims have created a uniquely better way to stay dry.